Today’s ride was titled “Just Noodling – 1″. Apparently it’s the first in a series. We started out going east for a bit to Michillinda, and then south to Huntington. Then we rode all the way into El Sereno before turning off onto a little side street. Then we went up a steep hill. On the way down the other side, that was where I saw “The Bowman”. At the bottom, we took a right and rode up an even steeper hill. I almost said ‘uncle’ and shifted to a lower gear, but Gene said that there was an even steeper hill coming up later, so I didn’t want to spoil the fun. At the top, we stopped to catch our breath for a minute before taking in a nice long, winding downhill that came out at the bottom right by the Pasadena Freeway and the Audubon center at Debs Park. Then we took a little side trip up the street there to see a giant dragonfly sculpture before doubling back and getting on the Arroyo Seco bike path. The bike path entrances are blocked by metal pipe hurdles. I guess that keeps people with motorcycles out, but it meant that we had to do a bike portage. They were a little too tall to bunny-hop over. Then when we got on the path, it was very pleasant, although it was a bit weird to be riding bikes in a river bed. We rode for a bit and then portaged off the path at Hermon Park. There was a dog park there, and adding an Only-in-L.A. touch, there were posters for a dog film festival. “Sit. Stay. Roll Film.” We also were amused by the separate ‘Small/Shy Dog’ area of the dog park. Leaving the park, we rode over a series of the nastiest speed bumps ever before coming out at Monterey Road. We went right, up a hill. That was where Makoto and I got lost. We missed a turn and ended up back down on Huntington. So we had to turn around and go back, and then ride up Via Marisol up and over the hill, only to end up back at Monterey Road again. Then we went right again and went up another nice, steep hill. Again, I almost said ‘uncle’ and shifted, but Gene still said the worst was yet to come. At the top, we crossed into South Pasadena and went down a big hill. At the bottom, we started up another hill, and Gene said that this was the hill we’d been waiting for. But it wasn’t steeper than the others. The only bad thing about it was that there was no shade, and it was pretty hot by this time. But aside from that, it was fine. At the top, we saw some funny lawn sculptures and the South Pasadena water tower. Then we headed down the hill. At the bottom we came out on Monterey Road again. I think there was probably an easier way to get there, but hey. We do this because it’s fun. We went on Monterey a bit to get into South Pasadena, were we stopped at the little coffee shop that has the Twinkies on the counter. Today they had bothTwinkies andDing Dongs there. I got a bagel. While we were sitting there, another couple rode in and we were looking at the woman’s bike. It was a little bike. She said she is 4′ 11″ and the bike has an extra-small frame with 650 wheels instead of the usual 700. It looked correctly proportioned, but the chainrings looked kind of big on it. The rest of the ride home was Gene’s route across San Marino. When we got to Huntington, I took off and rode out to Monrovia just to add a little more distance. When I got to Shamrock Ave I stopped and got a picture of the antique gas station there. The pump price was 33 1/2 cents per gallon, which is about a 1970 price. The rest of the ride home was the standard route across Sierra Madre. When I got home, I had 49.3 miles, so I rode around the block a couple of times just to get to 50. It was a nice ride. 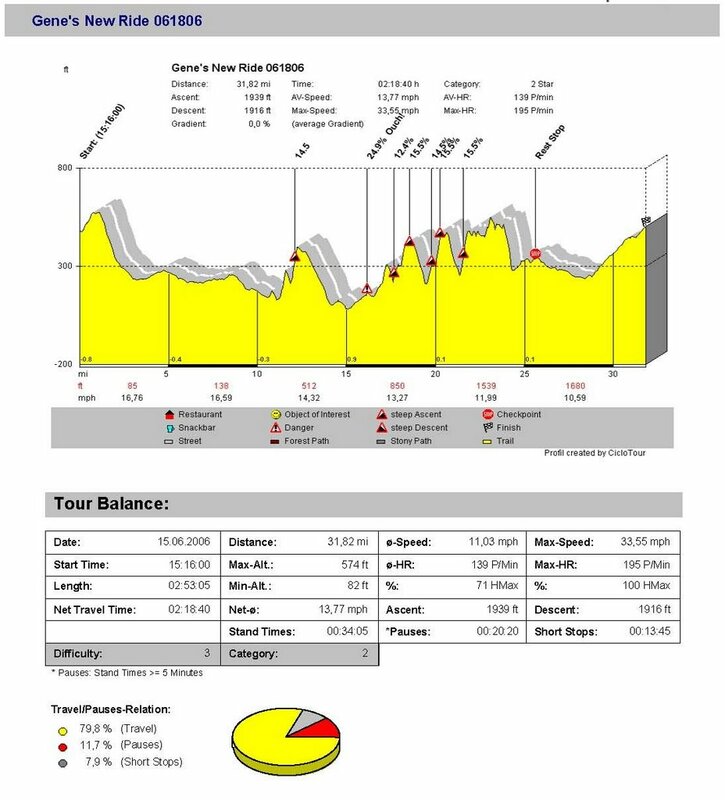 Addendum: Here’s a profile of the route, as recorded by Newton’s very fancy bike computer.